Webcam Antibes Juan-les-Pins: Waterfront - A video from Antibes Juan-les-Pins, Côte d'Azur, refreshed several times per day. Cannes: View over Cannes, 5.4 mi. Cannes: Port of Cannes, 5.8 mi. Cannes: La Croisette & Marina, 5.8 mi. Cannes: Panoramique HD, 5.8 mi. Saint-Laurent-du-Var: Centre Nautique, 7.1 mi. Nice: Radisson Blu Hotel, Nice, 9 mi. Nice: A8 - Nice St Isidore, 9.5 mi. 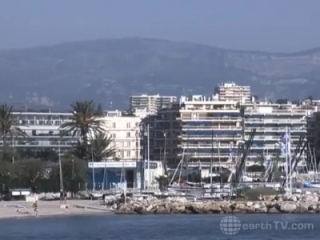 This webcam Antibes Juan-les-Pins with the theme Seaview was added on March 24, 2009 and is operated by earthTV. It got 67171 visitors since then. Shouldn't this webcam work or should the link be wrong please report that here. You can add this webcam here to myCams.